Dr. Shivaram completed his orthopedic training with Dr.Arsen M. Pankovich at Cook County Hospital in Chicago, which was a major trauma center. He also had extensive hand surgery training under the well-known hand surgeon Dr John Bilos. His training also involved hip and knee joint surgeries and joint replacements in addition to general fracture treatment. He also treats pediatric orthopedic patients in addition to adult orthopedic patients. As an avid biker he brings a unique personal aspect to treating patients with biking related orthopedic problems. 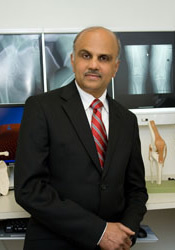 Dr. Shivaram's hobbies include biking, cross country skiing, theater, playwriting and music.